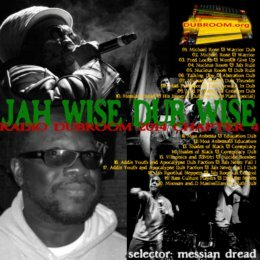 WWW, May 2014 - Featuring Michael Rose, Fred Locks, Mad Professor, Twilight Circus and a special Dub Plate version of Messian Dread's brand new Imperial dubwise riddim among many more touch and conscious selections, we're happy to present the fourth chapter of Radio Dubroom 2014. The set opens up with Michael Rose's "Warrior" and Dub, followed by Fred Locks singing "Won't Give Up". These are all releases by the Canadian but Netherlands based Dub producer Twilight Circus. Check them out at www.twilightcircus.com. Nucleus Roots and Talking Dog, both located in the UK give some crucial sounds before we return to yet another Dub with Michael Rose from the Twilight Circus. Two selections from Universal Egg's release "The Inspirational Sounds of Mad Professor" prelude a special mix of the recently released "His Imperial Dubwise" riddim by your's truly, which you can only hear in this podcast and is not available for download or streaming on any site. The second half of this chapter opens with Moa Anbessa's excellent "Education" riddim. Presented both in Dub and in the Vocal version, which is the same with Shade of Black's perfect track "Conspiracy". Vibronics and I-mitri from a free album which will soon be reviewed in the Dubroom follows, and some material by the Maltese Net Label DUB KEY. "Dub the Streets" by the Bass Culture Players is next, while the show closes off with a solid Steppers by Mixman and D Maximillian.